If you have attempted repairs on your 4th generation iPod Touch it is easy to accidentally damage the LCD connector socket for the screen located on the iPod Touch logic board.If you have damaged this screen socket we will replace the LCD connector socket with a brand new part, restoring the function of your iPod Touch 4th generation screen.Symptoms of failure from physical damage to the socket include the screen no longer displays an image at all, or the screen displays a white screen. 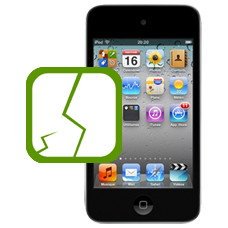 This is an in-house Apple iPod repair service, when ordering this service you are required to ship your iPod into our repair centre for works to be undertaken. You will be sent shipping details once your order has been processed.